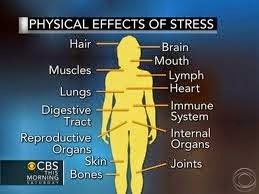 ...Did you know that according to the Centers for Disease Control and Prevention, it is estimated that up to 90 percent of all illness and diseases are stress-related. Stress can affect people in many different ways. Some people may notice tension in their neck or shoulders. Some have problems with their back. Other people get headaches, and sometimes even migraines. Some may come down with a cold. For some individuals, stress can cause sleep problems; either difficulty falling asleep, or waking up in the middle of the night and not being able to get back to bed. Many people deal with stress by eating. This may explain why it is so difficult for so many of us to lose weight. Others resort to smoking. Some individuals may even turn to drugs or alcohol if the stress becomes overwhelming. Stress can also affect your concentration and memory. It can lead to gastrointestinal disorders and may cause pain. It can also contribute to health problems, such as high blood pressure and diabetes. 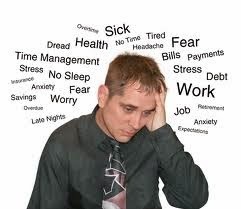 Stress can lead to anxiety or depressive disorders. Even worse, stress can contribute to heart disease and stroke. There is even the possibility that stress may be a contributing factor in dementia. Certainly stress must be taken seriously. We all have to deal with stress in our lives. The problem is when stress is prolonged or there are too many stressful events we are dealing with it can have a profound effect on our well being. While some people can handle stress better than others, there are things we can all do to lessen the effects of stress. There is a way that’s been proven effective in helping people reduce the negative effects of stress. It is with the use of hypnosis. Many peer review studies have now been conducted which attest to the fact that hypnosis is effective and works very well in many different areas. Hypnosis can be extremely helpful in reducing the negative effects of stress on our bodies and our minds. One very helpful element of hypnosis is that it is very relaxing. That alone is quite helpful when dealing with stress. In addition, hypnosis can help one to find out unhealthy patterns and beliefs which make the stress so much worse. There is another way hypnosis can help us to reduce the negative effects on stress. This is by learning self-hypnosis from a qualified hypnotist. The great advantage of learning self-hypnosis is that one can use it practically any time one needs to. In addition, the individual is totally in control of the session. He or she determines when to use it, and what to use it for. Just a few minutes of self-hypnosis is equivalent to a short nap. It totally refreshes you and helps you to deal much more effectively when confronted with stressful situations. Thanks for sharing the links. Its really helpful...!!! Think of it this way; If you bought a car and then drove it around recklessly, not taking proper care of it, the car will break down. You are putting way too much exertion on the engine to keep it running for very long.